Motherwell snatched a late draw against Hibs in a remarkable 12-goal thriller. Hibs' Colin Nish scored either side of Giles Coke's tap-in and a defensive slip let Derek Riordan put Hibs 3-1 up. Nish completed his hat-trick, then John Sutton headed one back for Well, and an Anthony Stokes double made it 6-2 before Coke's second sparked a revival. Tom Hateley struck from a free-kick and Sutton headed in a corner, then Ross Forbes missed a penalty before Lukas Jutkiewicz's injury-time leveller. The result is the highest-ever scoring match in the Scottish Premier League and handed Motherwell the advantage in their challenge for a Europa League qualifying slot. Craig Brown's fourth-placed Steelmen are now one point ahead of Hibs going into the season's final round of matches on Sunday. Hibs missed a couple of early chances, but Well's relief was short lived as the visitors took the lead in the 11th minute with a well-worked goal. David Wotherspoon stroked the ball across from the right-hand edge of the box into the path of Nish and the former Killie man tapped in from six yards out. Two minutes later, Motherwell's Tom Hateley blasted in a powerful free-kick, but Hibs keeper Graeme Smith got a hand to it, then Nish almost doubled his tally with a low drive from the edge of the area that struck the upright. Motherwell were right back in the match in the 16th minute when Coke burst into the Hibernian box after Jutkiewicz, who along with Coke was returning to the team, sent the ball in from the right and the former Northampton Town man slotted in from close range. Barely four minutes later, the home fans were silenced when John Rankin broke free from a throw-in and delivered a ball for Nish to fire in from close range and give Hibs a 2-1 lead. In a moment of madness, Coke blundered a pass back and Riordan snatched the ball on the edge of the penalty area, rounding keeper Ruddy and slotting in from a tight angle to increase the visitors' lead to 3-1. As the interval approached, Nish netted his hat-trick with yet another close-range tap-in after Rankin played a neat ball across from the left-hand edge of the box. Before the break, Sutton pulled one back for Motherwell to make it 4-2 after Jim O'Brien sent in a delightful cross for the Englishman to deliver a flying header, then referee Willie Collum waved away Hibs' shouts for a penalty when Nish went down in the box. After the restart, Jutkiewicz delivered a long-range free-kick, but the Hibernian wall held firm, then a header from Hateley was almost defected into the Hibs net. Hibs all but put the match beyond their hosts in the 56th minute when Liam Miller cut back and the ball landed at the feet of Stokes who stroked home yet another close-range shot with the Motherwell defence rooted. Shortly after the hour mark, Stokes turned a Riordan cross into the back of the Motherwell net to take the score to 6-2 for Hibs, after the former Celtic striker's corner was cleared back out. Coke added another to his tally in the 67th minute when O'Brien's long-range shot rebounded off the post and the Englishman was on hand to fire in. Hateley netted the 10th goal of the evening for Motherwell directly from a free-kick in the 72nd minute when he delivered the ball in from distance and Hibs keeper Smith helped it into the back of his own net. Four minutes later, Sutton nodded in an O'Brien corner to reduce the deficit further for the Fir Park side. As the final whistle neared and the score stood at 6-5 to Hibs, Jutkiewicz was felled by Smith, but the big keeper guessed correctly after Collum had pointed to the spot, and saved substitute Forbes' penalty. In the dying minutes of injury time, Jutkiewicz pulled off an incredible draw for Brown's side with a tight-angled left-foot volley, holding off the Hibs defence and thundering in to the top left-hand corner. 90:00+3:45 Kevin McBride gives away a free kick for an unfair challenge on Michael McGlinchey. John Ruddy takes the direct free kick. 90:00+2:13 The assist for the goal came from Michael McGlinchey. 90:00+2:13 GOAL - Lukas Jutkiewicz:Motherwell 6 - 6 Hibernian A goal is scored by Lukas Jutkiewicz from inside the penalty area to the top right corner of the goal. Motherwell 6-6 Hibernian. 90:00+1:35 Michael McGlinchey gives away a free kick for an unfair challenge on Liam Miller. Graeme Smith takes the direct free kick. 89:16 John Sutton is caught offside. Indirect free kick taken by Graeme Smith. 88:35 Ian Murray takes a shot. Save made by John Ruddy. 87:26 Chris Hogg takes the direct free kick. 87:26 Substitution Abdessalam Benjelloun on for Anthony Stokes. 87:26 Ross Forbes challenges Liam Miller unfairly and gives away a free kick. 85:48 Penalty taken by Lukas Jutkiewicz saved by Graeme Smith. Motherwell 5-6 Hibernian. 85:48 Foul by Graeme Smith on Lukas Jutkiewicz, Penalty awarded. 82:59 Lukas Jutkiewicz takes a shot. Save made by Graeme Smith. 81:46 Ross Forbes concedes a free kick for a foul on David Wotherspoon. Chris Hogg restarts play with the free kick. 81:01 Free kick awarded for an unfair challenge on Kevin McBride by Ross Forbes. Direct free kick taken by Chris Hogg. 80:07 Corner taken left-footed by Ross Forbes to the near post, Liam Miller manages to make a clearance. 79:21 Stevie Hammell restarts play with the free kick. 79:21 Substitution Tom Hateley goes off and Ross Forbes comes on. 79:21 Free kick awarded for a foul by Liam Miller on Jim O'Brien. 78:28 Unfair challenge on Steven Thicot by Lukas Jutkiewicz results in a free kick. Chris Hogg restarts play with the free kick. 75:57 Assist on the goal came from Tom Hateley. 75:57 GOAL - John Sutton:Motherwell 5 - 6 Hibernian John Sutton scores a headed goal from close range. Motherwell 5-6 Hibernian. 73:06 Lukas Jutkiewicz challenges Chris Hogg unfairly and gives away a free kick. Direct free kick taken by Graeme Smith. 72:45 Michael McGlinchey takes a shot. Save by Graeme Smith. 71:53 GOAL - Tom Hateley:Motherwell 4 - 6 Hibernian Tom Hateley finds the net with a goal from a long way out low into the middle of the goal. Motherwell 4-6 Hibernian. 69:20 Substitution Kevin McBride joins the action as a substitute, replacing Derek Riordan. 69:00 Substitution Chris Humphrey is brought on as a substitute for Steven Saunders. 68:38 Substitution Michael McGlinchey replaces Jamie Murphy. 66:32 The assist for the goal came from Jim O'Brien. 66:32 GOAL - Giles Coke:Motherwell 3 - 6 Hibernian Giles Coke finds the net with a goal from inside the six-yard box low into the middle of the goal. Motherwell 3-6 Hibernian. 66:10 Shot from long distance by Jim O'Brien bounces off the post. 65:49 Short corner worked by Tom Hateley. 64:50 Foul by John Rankin on Jamie Murphy, free kick awarded. Tom Hateley crosses the ball in from the free kick, clearance by Chris Hogg. 64:01 Derek Riordan provided the assist for the goal. 64:01 GOAL - Anthony Stokes:Motherwell 2 - 6 Hibernian Anthony Stokes grabs a goal from inside the six-yard box to the top left corner of the goal. Motherwell 2-6 Hibernian. 63:39 Corner taken by David Wotherspoon played to the near post, clearance by Giles Coke. 63:22 Shot from 30 yards by John Rankin. Blocked by Mark Reynolds. 62:35 Effort from outside the penalty box by Derek Riordan goes wide left of the goal. 61:32 Corner taken by Tom Hateley from the right by-line played to the near post, save by Graeme Smith. 59:46 The ball is sent over by Steven Saunders, Lukas Jutkiewicz takes a shot. Save made by Graeme Smith. 58:56 Unfair challenge on Mark Reynolds by Colin Nish results in a free kick. Free kick taken by John Ruddy. 55:36 Assist on the goal came from Liam Miller. 55:36 GOAL - Anthony Stokes:Motherwell 2 - 5 Hibernian Anthony Stokes gets on the score sheet with a goal from inside the six-yard box to the bottom left corner of the goal. Motherwell 2-5 Hibernian. 53:27 Anthony Stokes concedes a free kick for a foul on Stephen Craigan. John Ruddy takes the direct free kick. 51:01 Mark Reynolds fouled by Colin Nish, the ref awards a free kick. Stephen Craigan restarts play with the free kick. 50:30 Lukas Jutkiewicz produces a drilled right-footed shot from deep inside the penalty area which goes wide of the right-hand post. 49:04 Ian Murray gives away a free kick for an unfair challenge on Lukas Jutkiewicz. The ball is sent over by Stevie Hammell, John Sutton takes a shot. Graeme Smith makes a save. 47:09 Unfair challenge on Tom Hateley by Chris Hogg results in a free kick. Jamie Murphy produces a strike on goal direct from the free kick. 45:46 Foul by Chris Hogg on Lukas Jutkiewicz, free kick awarded. Tom Hateley takes the free kick. 44:30 Free kick awarded for an unfair challenge on John Sutton by Ian Murray. Direct free kick taken by Tom Hateley. 42:42 Mark Reynolds concedes a free kick for a foul on Colin Nish. Derek Riordan has an effort direct from the free kick. 41:27 Steven Saunders challenges Anthony Stokes unfairly and gives away a free kick. Direct free kick taken by Ian Murray. 40:26 Jim O'Brien takes a shot. Graeme Smith makes a save. 40:03 Foul by Colin Nish on Stephen Craigan, free kick awarded. Direct free kick taken by Stephen Craigan. 38:10 The assist for the goal came from Jim O'Brien. 38:10 GOAL - John Sutton:Motherwell 2 - 4 Hibernian John Sutton finds the back of the net with a headed goal from inside the area. Motherwell 2-4 Hibernian. 36:19 Effort on goal by Giles Coke from just outside the penalty area goes harmlessly over the target. 35:15 Assist on the goal came from Derek Riordan. 35:15 GOAL - Colin Nish:Motherwell 1 - 4 Hibernian Colin Nish fires in a goal from inside the box to the bottom left corner of the goal. Motherwell 1-4 Hibernian. 34:06 Stevie Hammell takes a inswinging corner from the right by-line played to the near post. 31:32 The official flags Lukas Jutkiewicz offside. Graeme Smith takes the free kick. 30:03 Ian Murray concedes a free kick for a foul on Steven Saunders. The free kick is swung in left-footed by Stevie Hammell, clearance made by Ian Murray. 27:16 GOAL - Derek Riordan:Motherwell 1 - 3 Hibernian Goal scored by Derek Riordan from inside the penalty box low into the middle of the goal. Motherwell 1-3 Hibernian. 26:18 Corner taken left-footed by Stevie Hammell to the near post, clearance made by Paul Hanlon. 24:20 John Sutton produces a left-footed shot from long range which goes wide right of the goal. 21:22 Colin Nish gives away a free kick for an unfair challenge on Tom Hateley. Direct free kick taken by Stephen Craigan. 20:22 Giles Coke concedes a free kick for a foul on John Rankin. Free kick taken by Graeme Smith. 19:29 John Rankin provided the assist for the goal. 19:29 GOAL - Colin Nish:Motherwell 1 - 2 Hibernian Goal scored by Colin Nish from inside the penalty box low into the middle of the goal. 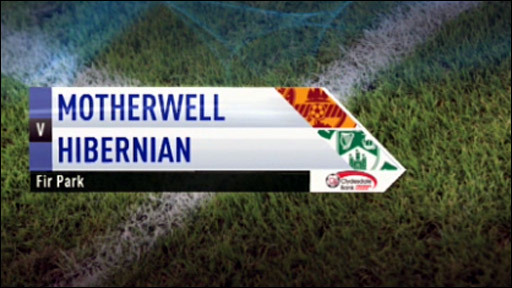 Motherwell 1-2 Hibernian. 17:36 Jamie Murphy fouled by John Rankin, the ref awards a free kick. Tom Hateley restarts play with the free kick. 15:34 Assist by Lukas Jutkiewicz. 15:34 GOAL - Giles Coke:Motherwell 1 - 1 Hibernian Giles Coke fires in a goal from close range low into the middle of the goal. Motherwell 1-1 Hibernian. 13:59 Colin Nish has an effort at goal from just outside the box which goes wide of the left-hand upright. 13:40 Shot from 35 yards by Jamie Murphy. Save by Graeme Smith. 11:07 Lukas Jutkiewicz fouled by Chris Hogg, the ref awards a free kick. Tom Hateley produces a strike on goal direct from the free kick, Graeme Smith makes a save. 10:22 Assist by David Wotherspoon. 10:22 GOAL - Colin Nish:Motherwell 0 - 1 Hibernian Colin Nish finds the net with a goal from close in low into the middle of the goal. Motherwell 0-1 Hibernian. 8:44 Liam Miller challenges Giles Coke unfairly and gives away a free kick. John Ruddy takes the free kick. 4:55 Effort from deep inside the area by Anthony Stokes misses to the left of the target. 3:57 Free kick awarded for an unfair challenge on Liam Miller by Giles Coke. John Rankin takes the direct free kick. 1:28 Steven Saunders gives away a free kick for an unfair challenge on Colin Nish. Derek Riordan crosses the ball in from the free kick, Unfair challenge on Stevie Hammell by Chris Hogg results in a free kick. John Ruddy restarts play with the free kick.